Charles Thurstan Holland was born on March 1863 at Bridgwater in Somerset, the son of William Thomas Holland and his wife nee Florence Du Val. He entered the medical profession and qualified in 1888 at University College in London. He became a general practioner in Liverpool, but made a great reputation as a pioneer radiologist. His application of X-rays in medicine and surgery earned him world-wide recognition. When the properties of X-rays were first demonstrated, Thurstan Holland at once recognised their importance in medical diagnosis and surgical treatment. From 1896 to 1904 he was honorary radiologist to the Royal Liverpool Hospital, and from 1904 to 1923 to the Royal Infirmary in Liverpool. In the First World War he held the rank of Major in the Royal Army Medical Corps, and was Consultant Radiologist to Western Command. Using the principles of the gunner's height finder, he developed a remarkable depth finder for finding bullets in bodies, which proved invaluable in treating patients. After the War he was appointed Lecturer and Radiologist at Liverpool University. In 1924 he married Lilian Fergusson, daughter of J. Fergusson of Liverpool. In the following year he was elected President of the First International Congress of Radiologists, held in London. Among many other honours he was a Deputy Lieutenant for Lancashire, holder of the Territorial Decoration, a Fellow of the American College of Radiology, and was twice President of the Rontgen Society. Thurstan Holland was an accomplished photographer, and achieved distinction with his Alpine pictures. 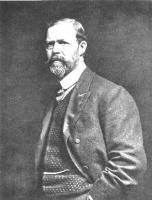 He was the first President of the Lancashire and Cheshire Photographers' Society, and a popular lecturer on photography and climbing (1). He died on 16 January 1941 in Liverpool. His wife had predeceased him in 1924. (1) Obituary in The Times dated 17 January 1941.